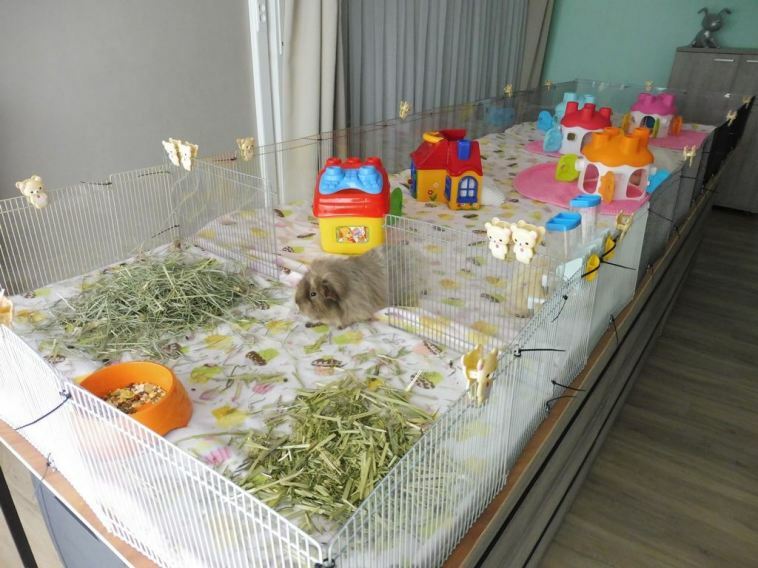 Entertaining your piggies can be done by offering them a pig buddy (prevent breeding), a large cage, a pile of hay daily and a few hideys to start with. However, since they have to spend many years in it, you can make their lives much more fun and offer them some variation. We are all aware of the hideys we can buy in stores. The wooden ones need to be checked for safety, as there should be no staples, and screws should run deep enough so they can’t be accessed and swallowed. If parts are glued, make sure it’s done with kiddie safe glue. And then there are grass houses, hay huts, willow tunnels, cardboard boxes, etc, etc. Or how about all those fabric sleeping beds, huts and pouches. All fun, as you can see here, but it does not last forever, it wears fast. Still, there is a lot of stuff you can use, which can be found in garage sales, second hand sites, maybe even your own attic. 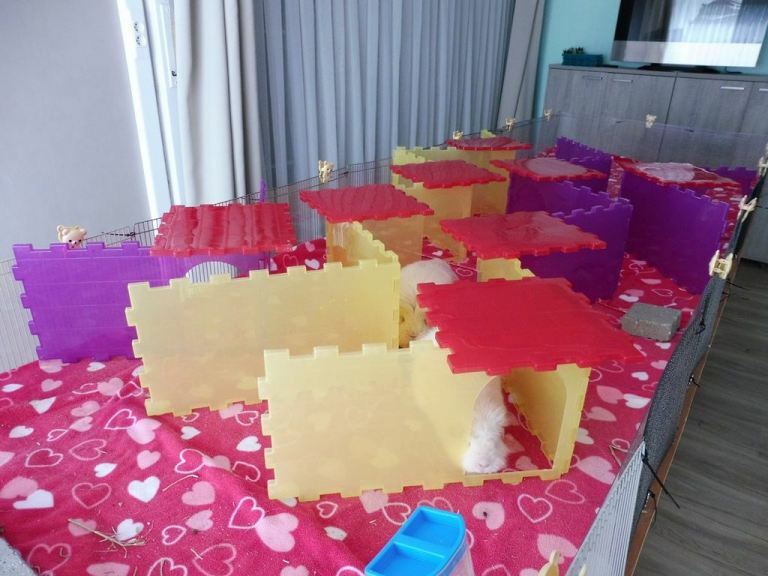 As long as the plastic is hard, chewable parts are removed, excess parts are discarded, a lot of items can be used to save your pigs from boredom. Wood decays, plastic stays, that’s my motto. It’s always easy to keep hygienic and will probably outlive the caretakers. Just some soapy water with a dollop of disinfectant, a soft brush to clean it, rinse well with water after, let it dry. I will share my most favorite ideas with you. I’m pretty sure that some will appeal to you, and inspire you! Let’s start with old Playmobil stuff. Here is an example of parts used from the old Western range. Pro: it’s immense fun to watch pigs play in it and they love the variety a lot. 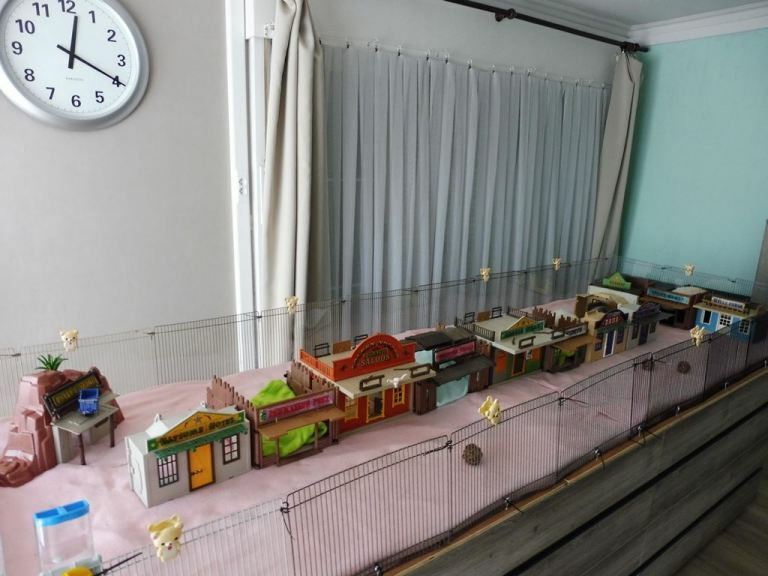 You can make streets and rearrange the lot, to your heart’s desire and the pigs will love you for it. Con: cleaning needs to be done in detail using a soft brush, and it takes time to get in all nooks and corners. It can be stored flat if you take it apart, otherwise it takes up space to store it. The most amazing variable idea, excuse the pun, is a maze, made from waffle blocks. It’s a favorite item to have. Pro: the pigs go nuts over it! It’s fun to build one. It can be cleaned in a dishwasher if that does not freak you out. It stores flat. Con: the price tag if you have to buy them new. They don’t seem to come second hand often, hence why they stay pricey. 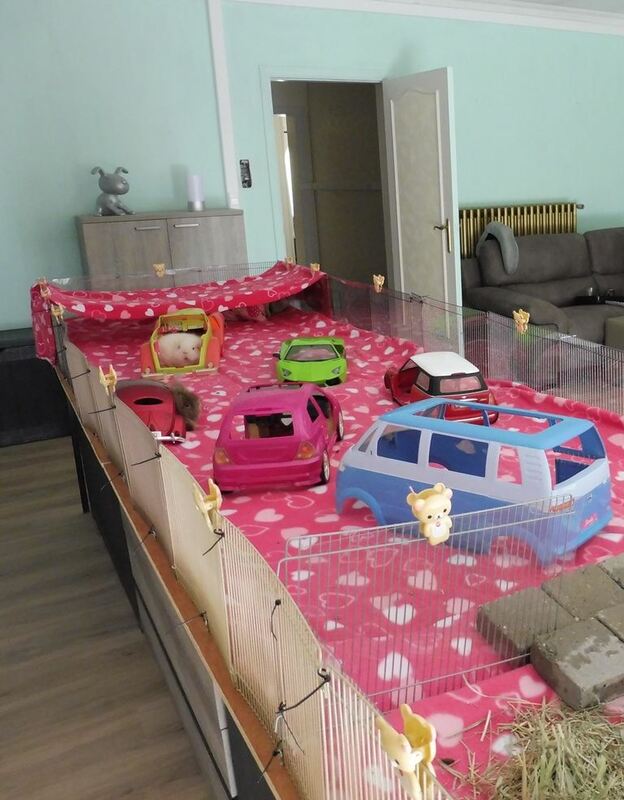 Pro: the weight of this type of car is often just right so pigs can actually push them around, which they love, so you can enjoy the local cage traffic yourself. Con: not all cars of that size are big enough. Some have flat roofs, like SUV style cars, those will allow a pig to jump on, because of the lower height, and drop off, those are to be avoided. This vid contains a very easy item to use: step stools. At the end of the vid, you will also spot Ikea bookshelves set as a mini maze, a toddler bug ride and 2 plastic beds. Pro: no need to revamp any of these items. Step stools can be stored stacked. Con: most pigs are not fond of beds unless they have some top cover. Make sure that the step stools have a rounded edge, this prevents pigs from trying to jump onto them, so they can’t fall. Bigger old car toys are even better, as they do allow for pigs to sleep together. Scaled 1/8 is awesome, 1/6 is even better, as it allows 3 pigs in one car without hassle. 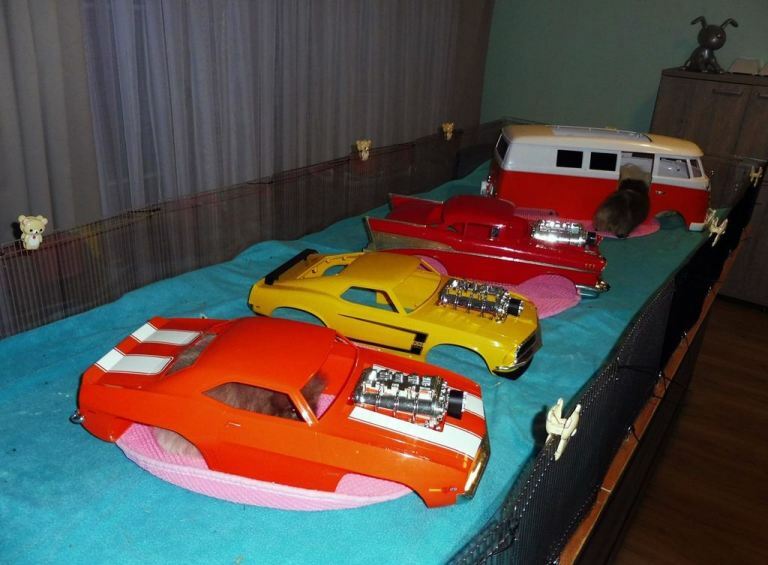 Out of all of these, the pigs love the VW Samba bus most. Pro: easy to clean. One big car has several entrances, including the wheelbases, whereas pigs love to crawl through. Con: they take up a lot of space to store. 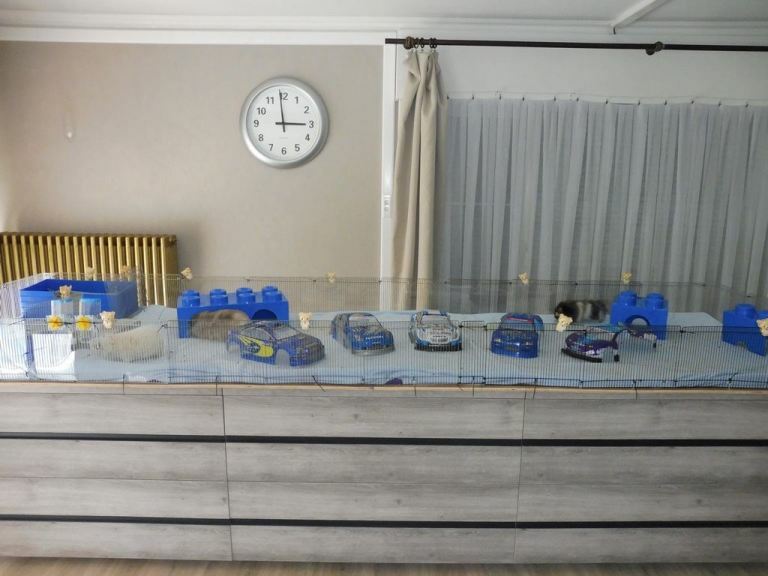 And as long as we are on the car theme: 1/10 scaled car bodies for RC cars are fab! You can cut one large entrance out with scissors. Lexan is hard enough to prevent chewing, but can be cut easily. Pro: as these are lightweight, the pigs will carry them around on their back. You will see several car collisions. They can be found online, dead cheap. Con: You need a big cage to have a few of these, as it will allow car collisions to be pushed aside easily by the pigs themselves. They will corner themselves in, in a small cage. Old one-story doll houses are such fun as well. This vid contains 2 of my most favorite houses. The first are Snow White houses, which offer cover and open space at the same time, so there is no room for disputes over who gets in and out first. The Smoby Cotoons block sorter houses are awesome! They store stacked, have 4 entrances, 4 chimneys to ventilate the house properly, and they can be found cheap second hand! Note that there is a cat egg treat ball in the middle of the vid, more about that later. 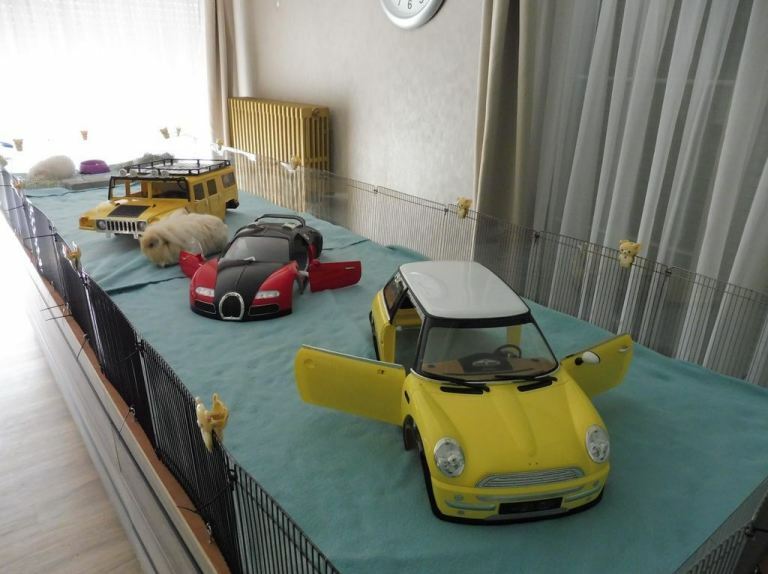 Pro: Because of the accessibility to get in and out, dollhouses are great to prevent disputes. 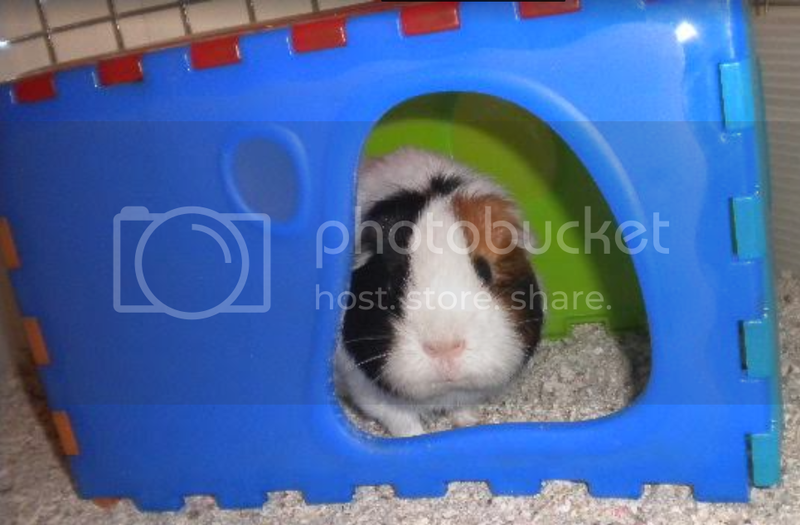 The Smoby houses also provide some shelter from hormonal or dominant pigs, because of the shape. And the doors can be closed, which I have seen pigs do on their own, for some privacy! Cons: if you buy a big dollhouse, it needs a sizey storage place. A treat ball is a must-have, seriously. You do not need to offer it daily, but it makes a nice change once a week. 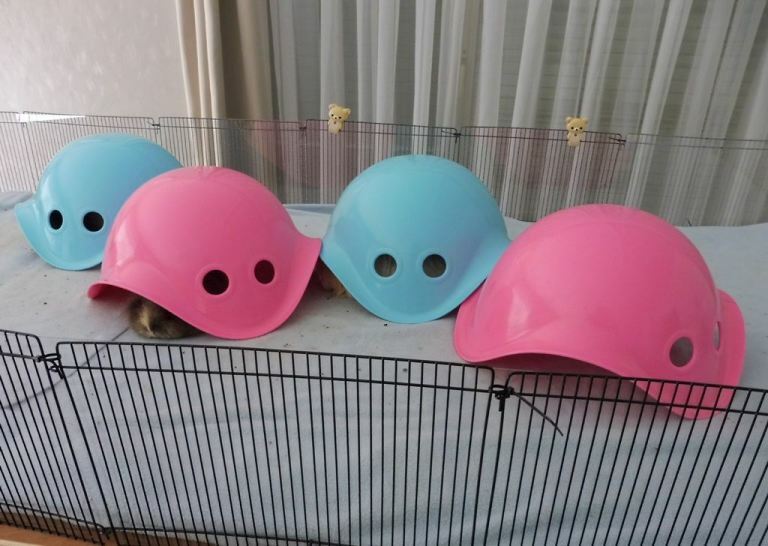 Don’t worry, pigs get the hang of it fast. I fill mine up with dried low calcium small pieces of vegs, for example, as the treat needs to be healthy. Here are 2 vids. One is a homemade version, made from a free dog ball I got. Spot the jeans hideys, made from old jeans. Just cut off a leg long enough and roll the edges up, that way, it won’t collapse, unless a pig decides to sleep on top. Pro: once the egg is empty, they won’t play with it anymore. All that hard work to roll it, needs a reward to do so! Con: the biggest treat shark of the cage will eat the best parts, the others the leftovers. I discovered that Bilibos are super hideys. They have 3 entrances, so disputes are up to a minimal. They are big enough to house 2 pigs. They can even be put together side by side, to form a snake type of tube. There are more store bought bunnyloos in the vid, also a perfect size for pigs. Note the toddler bath toy scoop in the vid, it’s also a cute item to have. Pro: Bilibos stack together and clean fast. Con: Bilibos take up some space in storage, as they are big. They are not very cheap second hand either, but if you spot one cheap, don’t leave it behind! Tired of your salad bowl? Cut out a large entrance, file down the edges and you will have a wonderful hidey! Or, how about a fleece car wash / forest? The second part of the vid has some, it’s such a joy to have as well. Pro: Salad bowls cost almost nothing if you watch out for them. Fleece car washes / forests take up no space at all. Con: see if you can tie the fleece, as pigs will plunge themselves onto it if they can, so they come down easily. You need a metal handsaw to cut entrances in a bowl, plus a nail file to soften the edges. 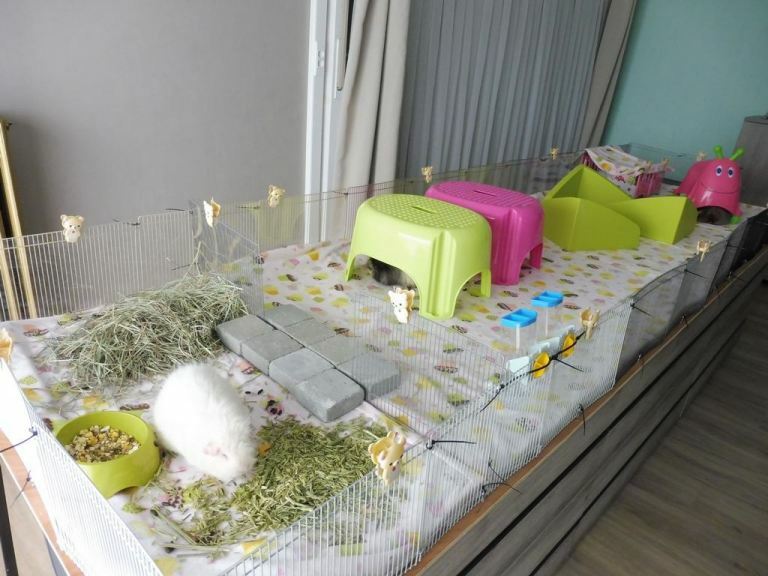 As with any item you add to the cage, think about from a piggie perspective and predict what mischief can be done with it, to prevent accidents. Then, sit down, and enjoy the pigs having oodles of fun. You will be loved more for it! Thank you, pigjes! This is timely as we just moved our pigs to a 20 sq ft cage, and we need boredom busters. 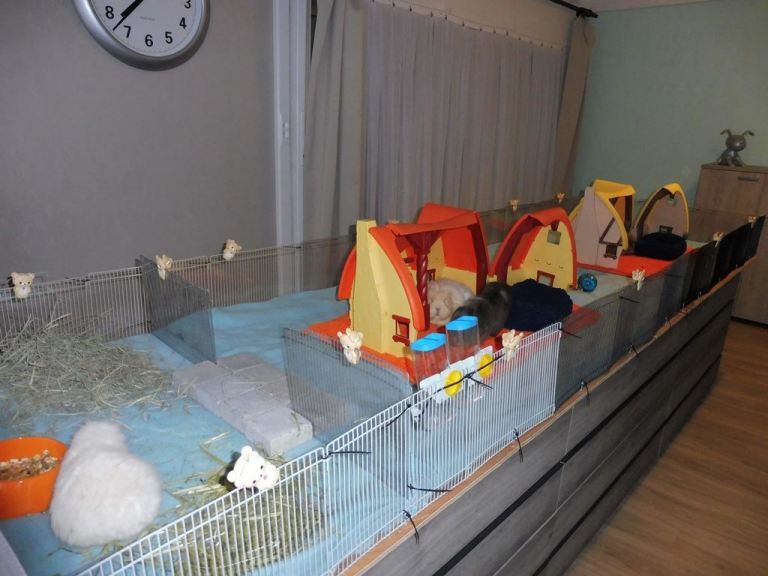 I'm making a fleece forest under their ramp, and adding grass huts, but am at a loss to what else to add. One of my friend's pigs loves lunch sacks(or used McD's bags). Pigjes is a guinea pig entertainment wizard! One caveat is to not use items where a guinea pig can be trapped (i.e. 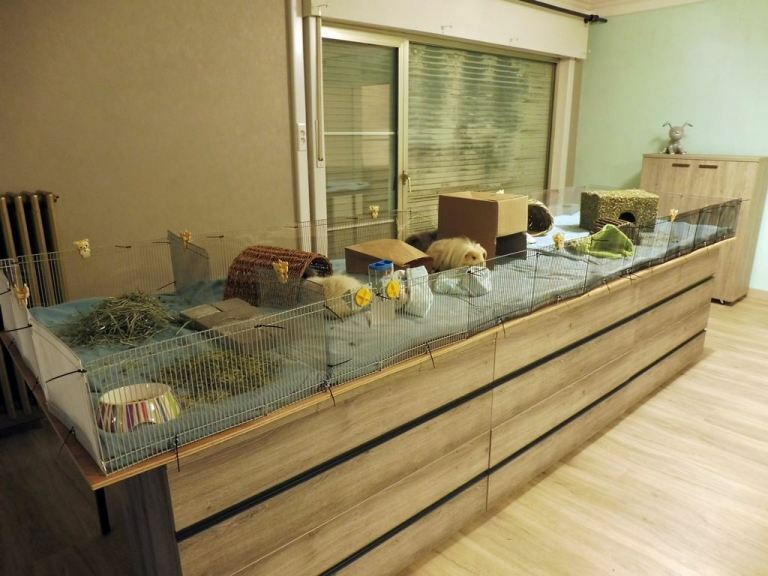 go for at least two entrances) if you have occasional fighting among your guinea pigs. Piigjes pigs have a huge place and I think don't fight. If at least 2 entrances are not possible, one which allows 2 pigs to pass at the same time, with room to spare, will do as well. Compare it to humans needing a garage door to get in and out a house, lol, instead of a door. I have made this temporarily a sticky, then later will add it to the Master Sticky (we tend to get too many stickies in this forum). Reposting a few of your cool cage pics would be great too! 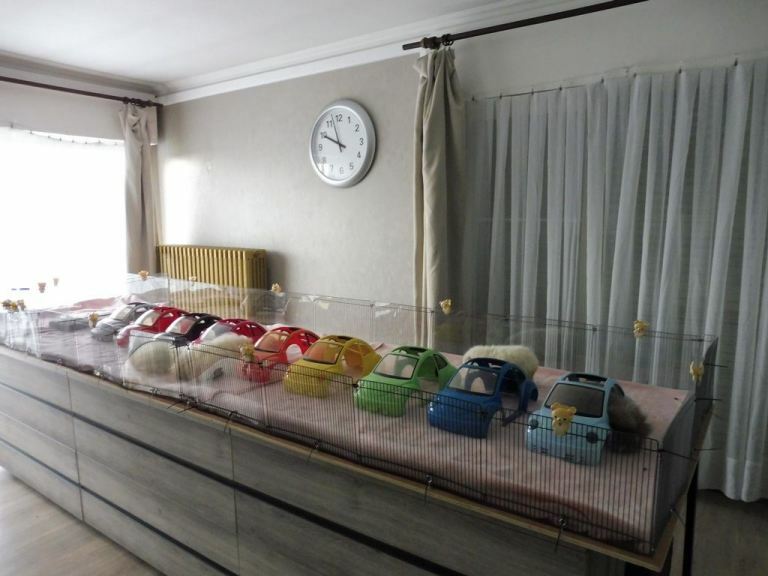 It would definitely illustrate how to outfit a cage for fun. Here are some of pigjes wonderful pics! Thanks for adding these permanently! I think it's more like, "Thank You!!" What crazy setups. I love it. Tracis, you'd be surprised!! Bubbly was my ADD pig, with insomnia. She got bored after a setting was in the cage after 3 days and started to annoy her sister Bubbly, so I had to vary more often than cage cleaning! It's a large cage, with lots to do. Kooky would have loved it. She was a loner pig and only got along well with others in huge cage. 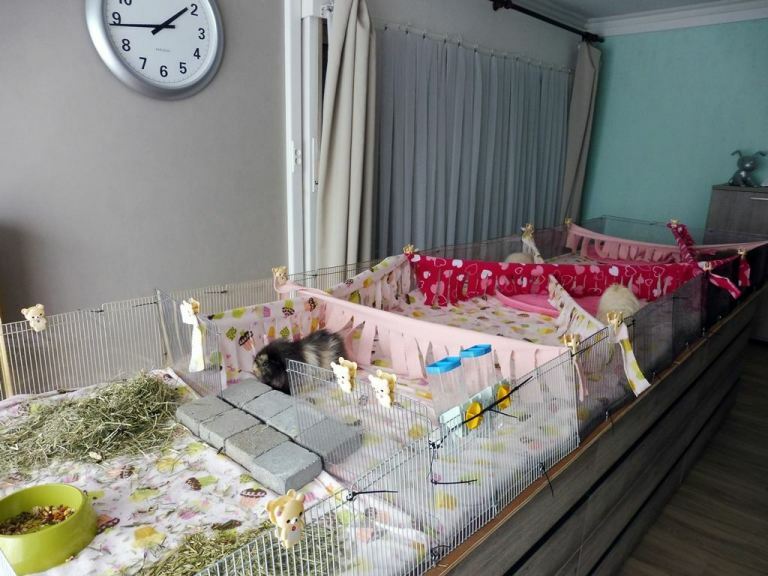 At the time, I had to keep enlarging the cage till Madam Feisty, aka The Tank, for bulldozing other pigs around, lol. Still, all pigs came to lay next to her when she was dying, so despite her Master Nipping skill, she was well loved. And, I guess most of you know that a mayor part of the pigs daily activity is to study human behavior. I can just see them talk to each other on how crazy I am compared to hub, lol. Pigjes, thank you so much for sharing your girls! I just love seeing them and their setups! Thanks for the pics! Pigjes, where do you get your waffle blocks? The only ones I can find are the Little Tykes ones, which are quite different. Yours are actually a lot like the Living World Snap Inn blocks (which I can't get in the U.S.). I put a Little People barn in mine, and they just loved it. Just kept going around and through the doors. There was a newer version, with funny shaped entrances, but I have no clue what brand that was. I bought mine many years ago. I was told that Petco used to sell the older version, like mine. I had thought of writing Living World about it. It's such a cool item. They really should sell the Snap Inn here. Ah, it's called a Snap Inn, thanks for telling us! Would definitely go for large ones if you can find one. Pigs prefer cardboard. I sometimes order a batch of new ones, as the ones which arrive as delivery boxes, are often printed with ink, and not all ink is soy based. Or contain staples, plastic document pockets, tape ... trying to remove those is a pain, as it often rips the box apart.